The departure of Sugar Club, the beloved Thai snack bar and prepared food market in Elmhurst, Queens left a void that is currently being half filled (because the space was subdivided – the other half is a tea shop) by Pata Market at 81-16 Broadway. I was pleased to find a considerable assortment of grab-n-go snacks, both sweet and savory. I’ve written about the sweets – now for some savory items. 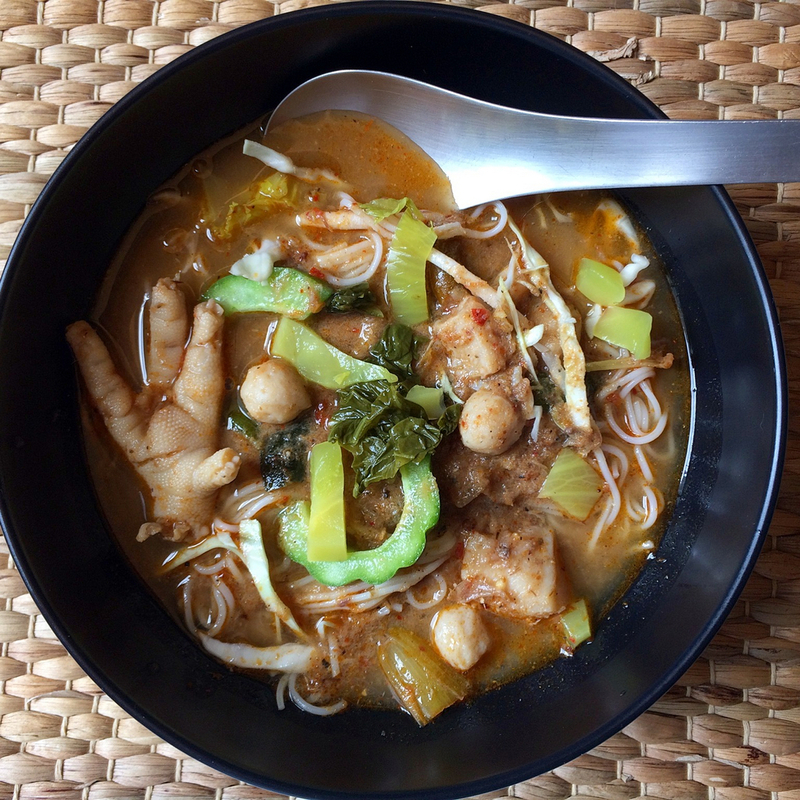 Today’s post covers their Kanom Jeen Nam Ya Paa, noodles with spicy fish curry. Kanom Jeen are thin, fresh rice noodles, an integral part of Thai cuisine; Nam Ya Paa refers to the spicy jungle curry (heavy on the spice with no mitigating coconut milk) soup. The curry, replete with chunks of fish, tiny fish balls and chicken feet is thickened with pork blood and seasoned fearlessly; the noodles, cabbage, bean sprouts, pickled vegetables, and bitter melon are packaged separately for à la minute addition. Definitely good eats! More savories from Pata Market to come.